WILLS POINT, Texas, March 4, 2019 /Christian Newswire/ -- An eye-opening report from GFA, a leading faith-based humanitarian agency, has revealed key new insights into a critical survival issue – what experts are calling a "worldwide water crisis" that threatens to get worse. Less than one percent of the planet's most vital resource is found in rivers and streams – with undrinkable ocean salt water comprising more than 96 percent. 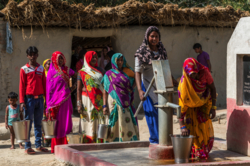 One of the world's leading nonprofit providers of clean drinking water, GFA has drilled more than 4,000 wells – called "Jesus Wells" – in water-starved areas of South Asia in 2017 alone. Celebrating its 40thanniversary in 2019, GFA (Gospel for Asia, www.gfa.org) is a leading faith-based humanitarian and mission agency, bringing vital assistance and spiritual hope to millions across Asia, especially to those who have yet to hear the "good news" of Jesus Christ. This has included more than 70,000 sponsored children, free medical camps conducted in more than 1,200 villages and remote communities, over 4,000 wells drilled, over 11,000 water filters installed, income-generating Christmas gifts for more than 200,000 needy families, and spiritual teaching available in 110 languages in 14 nations through radio ministry.